Monday, I wrote about having a bad day, this morning while writing my daily letter to God the Holy Spirit stepped in and scolded and reminded me since I’ve lived 3 or 4 years beyond the life expectancy of a patient with pulmonary fibrosis each day is a gift from God. Here’s a clip from the letter that start it all… Thank you for another day, what I should be doing thanking You for every day I wake up. And I need to drill into my thick skull any day I wake up is a good day! I am sorry for thinking otherwise. Then remembering Psalms 118 I took it upon myself to change it slightly and promise the LORD… “This is the day the LORD has given me I will enjoy every minute of it!” For me there is what I consider a line (similar to the Mason Dixon Line) dividing a life lived in the “land of positivity” or in the “land of negativity” and it seems in our world today the “law of gravity” is in favor the land of negativity constantly pulling us downward. Has the land of negativity got a hold on you? 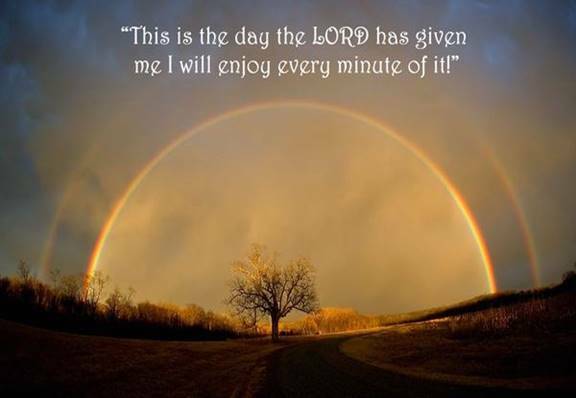 If so, turn on your imaging (imagination) and feel the lifting winds of the Holy Spirit and join me in proclaiming there are only good, better, and best days!